Mississauga Office Catering, Hwy 10 & Burnhamthorpe, Dine-in. Take-out. 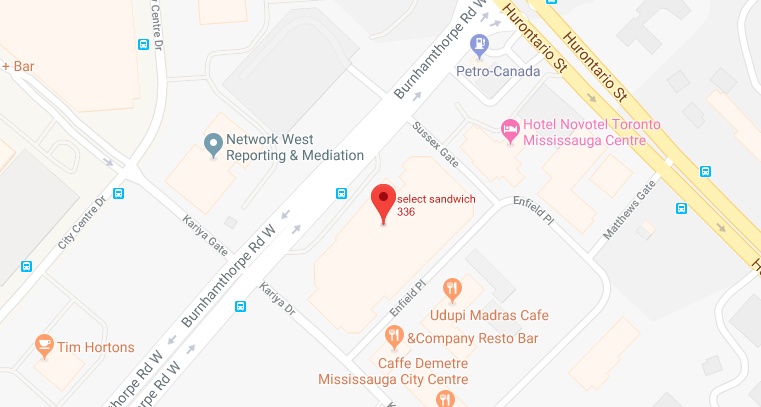 Located at 50 Burnhamthorpe Road West, Select Sandwich Mississauga is available for dine-in, takeout, as well as full-service catering. Our selection of tasty sandwiches, wraps, panini, salads, appetizers and entrees are made to order so you can enjoy the freshest and tastiest meal possible. Whether you’re grabbing a bite to eat with friends, or need to order catering services for a big event or corporate meeting, Select Sandwich can deliver. For breakfast, lunch, dinner or snacks, we create healthy, delicious and affordable catering options sure to please. Contact the Select Sandwich team today to learn how our Mississauga catering team can help!